"This is yummy for St. Paddy's Day!" Place the bacon in a large, deep skillet, and cook over medium-high heat, turning occasionally, until evenly browned, about 10 minutes. Remove the bacon slices to cool. Whisk the butter, flour, and salt into the drippings in the same pan. Stir in the cabbage, and cook, stirring occasionally, over medium heat until cabbage is tender, about 15 minutes. Crumble the bacon; stir the bacon pieces and sour cream into the cabbage mixture. 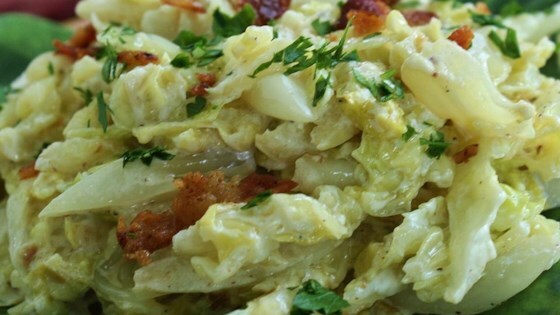 See how to make a creamy, incredibly easy cabbage side dish. This is, without doubt, the best cooked cabbage recipe I've ever tried. I made it exactly as written. The few leftovers went into some home fries the next morning and we loved it! This is great! Followed the recipe exactly. We're going to serve this for Thanksgiving and Christmas! YUM!! Yummy! I put in a little extra bacon (because you can never have enough bacon) and used it to fill a pita. Made a great little pita sandwich. Awesome! I used turkey bacon and fat free sour cream. So easy, yummy, healthy and economical.